SECRET PONCHOS FREE WEEK DECEMBER 14-20! THREE EXCITING THINGS COMING TO SECRET PONCHOS THIS WEEK! The week of December 14-20 only, anyone can play Secret Ponchos for free on Steam - spread the word to help us prevent a #secretfreeweek! We’re trying something new! It’s like Kickstarter stretch goals, but instead of paying money, we’ll distribute rewards based on how many players get online at the same time! We’ll be distributing new Music, Skins, and a new playable Outlaw if we hit our goals! GET SECRET PONCHOS FOR 50% OFF! A huge sale that we’re running during the Free Week for players who really enjoyed our game. To always hear the latest, join us on Facebook and Twitter! Oh and tune in to our weekly Twitch streams! ANNOUNCING THE CONCURRENT PLAYER CHALLENGE! To celebrate the FREE WEEK (Launching Dec 14th on Steam), we wanted to do something exciting for all players, new and old alike and are introducing “Concurrent User Challenge!”. 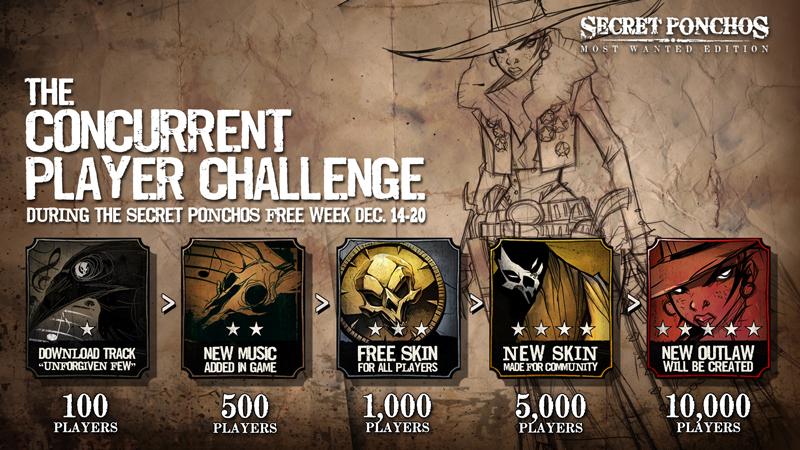 This challenge sets a series of milestones, in which the community can unlock brand new content for Secret Ponchos! To unlock rewards all you have to do is play the game - the more users the community can get playing at once, the more rewards become available. 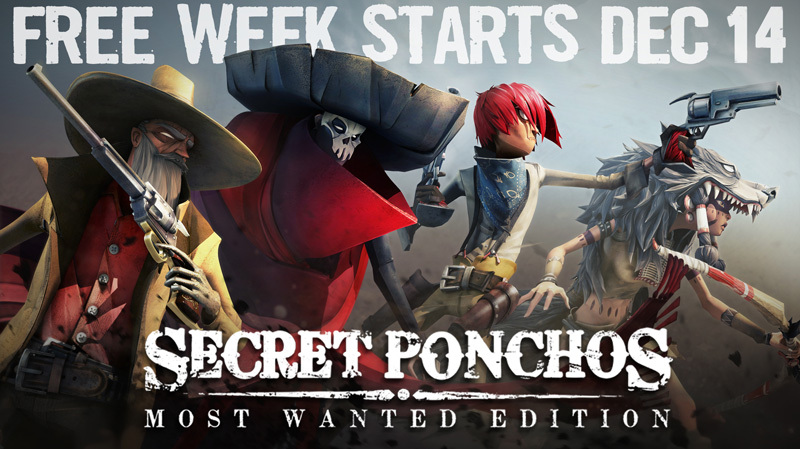 Help us, get the Secret Ponchos population jump started, by getting everyone you know to play, and spreading word of the Free Week! Let’s unlock that new Outlaw!